The aluminium bodied AC Cobra 260 sports car weighed 2170 lbs, compared with 3065 lbs for the Corvette Stingray, which spelt the first sign of trouble for Chevrolet. In 1961, with the departure of the two seater Thunderbird at the end of 1957, Ford were only too pleased to team up with Carroll Shelby to produce another two seater performance car with which to take on the Corvette which, by this time, had built up its own racing credentials. When it came to production of the Ace with a 260 ci V8 engine, few problems were encountered since the necessary modification to the chassis and body had already been anticipated in the initial drawings for a 221 ci (3.6 litre) unit. An additional change found to be necessary was to fit a stronger rear differential to take account of the increased torque of the new engine. The unit finally chosen was the Salisbury 4HU, which was the same as that used in the Jaguar E-Type. At the same time, the rear suspension had to be stiffened. Since the V8 engine was wider than the Ace's 2.6 litre unit, then the steering box had to be moved outwards, but this marked the final pre-production modification needed in the transformation of the Ace into the AC Cobra. The first production Cobra sports car was designated the Mark 1 variant, and was produced between 1962 and 1963. The first batch of 75 units of the Mark 1, including the prototype, were powered by the 260 ci (4.3 litre) Ford Windsor HiPo (High Performance) V8 engine. However, a further 51 units of the Mark 1 were fitted with the larger 289 ci (4.7 litre) Windsor HiPo engine. This unit was also used in the Mark 2 variant, which made its appearance in June 1963, and came from the same engine family as the 260 and 221 V8's. 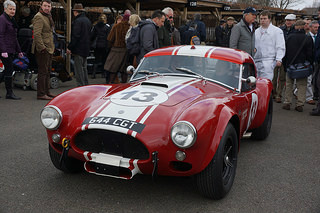 Of the 75 Mark 1 AC Cobras, 62 became street cars, with the rest being used by both the factory team and race prepared by individuals, many of which were subsequently fitted with the larger 289 engine. Using a single 4-barrel Holley carburettor, and fitted with hotter camshafts, solid tappets, larger ports, and a compression ratio of 10.0:1, the overhead valve 260 HiPo V8 developed 260 bhp at 5800 rpm, and 269 ft/lbs of torque at 4800 rpm. The most usable engine speed was in the range 2000-7000 rpm. Furthermore, for competition use, Shelby modified this unit by increasing the compression ratio to 11.0:1, and used four twin choke Webber carburettors, which allowed the engine to develop 335 bhp at 8500 rpm. Although the first prototype was fitted with a Ford 221 V8 engine, this unit was never intended to power the Cobra, and was only used as a template since it had the same external dimensions as the 260 V8. The first production AC Cobra sports car, with chassis number CSX2001, and fitted with a 260 HiPo engine, was used as a test car for motoring magazines. It was repainted almost every time a new test was conducted to give the impression that Shelby had plenty of new Cobras. Carroll Shelby had always wanted his Cobra sports car to be the Corvette conqueror. His chance came, on 2nd February 1963 at the Riverside International Raceway, when his Cobra CSX2026, one of the first Mark 1's built, beat a line up of Corvettes, Jaguars, Porsches, and Maseratis to record an historic first track win by a Cobra. CSX2001, amongst the first 75 AC Cobras to be received by dealers in 1962, was earmarked to race in the 1964 Le Mans, but was not entered since the 260 V8 was not competitive enough in practice. However, it was later updated with the larger 289 V8 engine, when it duly won many victories across Europe. No more than 1,000 AC Cobras were ever built.